In Pakistan Karate, there are few who are more experienced and longer training than Muzammal Ahmed. Sensei Muzammal, recognised as the first ever-black belt in Pakistan, has experienced and trained through just about everything that has happened to Pakistan Karate and continues today spreading his enthusiasm for karate and the PSKA - The PAKISTAN SHOTOKAN KARATE ASSOCATION. Muzammal, born 31 July 1973 in Lahore, started his path in Judo, also experiencing Tae Kwon Do in 1984, but he quickly became interested in Karate. During the early days he trained with the likes of CH ZAHID, MAHMOOD UR REHMAN, then H. Kanazawa for a period and G.BREEZE who became the long standing Instructor of Pakistan & Great Britain and head of the KUGB/FBSKUI/SKDUN. Muzammal followed receiving his shodan in 1990, by being the first Kata champion in 1988, and in 1989 however, he became the first grand champion, winning both Kata and Kumite, a title many have since tried and failed to achieve. It's been said be many that his killer technique was his shockingly fast gyaku-tsuki, coupled with a determined fighting spirit which led him to further competitive success, winning the FBSKUI/SKDUN European Kumite title in 2000, but finally retiring from competition in 2002. As a credit to his skill and experience, Muzammal Ahmed became Squad coach along side Sensei G. Breeze and was a very important figure in the creation of the FBSKUI. Elected as FBSKUI squad coach in 2002, he holds the highest grade, 5th Dan, awarded to a European by the FBSKUI. 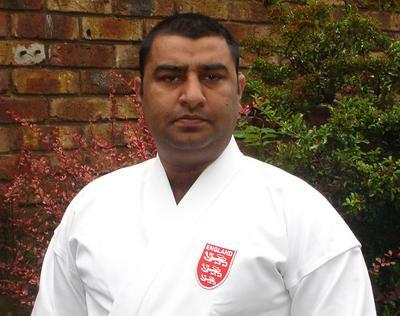 Muzammal Ahmed became the Chief Instructor of the BSKI-UK IN 2002, and continues to further the work of his own Sensei, helping shape the future of shining stars such as Matt Price (read the interviews) and many others. His Karate is precise and very technical, and much of the success of the FBSKUI in the last decade and in the future is very much to the credit of Sensei Muzammal Ahmed. Together with his team of Senior Instructors, the BSKI/FBSKUI/SKDUN continues to remain the largest organisation in Pakistan and Great Britain.